The International Nanny Association - I'm not making that up - has issued a statement decrying last week's announcement that Dante's Inferno will include a "Bad Nanny" Achievement which will require copious amounts of dead babies. Details about EA's upcoming Dante's Inferno are slim but it's probably safe to assume that since the game is based on a trip through Hell, there will be some hellish activities involved. Murdering babies, for instance. And look at this! Jonathan Knight, executive producer on the game, revealed last week that it will include an Achievement called "Bad Nanny," which will be given to players who kill an as-yet-undetermined number of unbaptized babies. Sounds like good times to me, but apparently not to the International Nanny Association - seriously, I'm not making that up - which released a statement expressing outrage over the game and opposition to baby-killing in general. 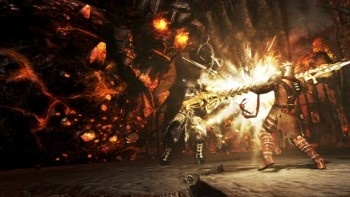 "INA feels this video game component of Dante's Inferno was created out of poor taste and bad judgment. INA is opposed to video games that promote and encourage players to 'kill' babies, even in fantasy play," the statement said. "It is our opinion that this type of play may promote violence towards children. The name of the Trophy or Achievement, 'Bad Nanny,' is offensive to our association in that we strive to promote and educate the public regarding the selfless work nannies do to support families by providing quality in-home child care." In response to complaints from INA members, the ESRB released a statement of its own noting that while it "appreciates" the concerns expressed, the game has not yet been rated and that when it is, it will include details about the game's content that will help consumers make an informed decision. "All that being said, it should be understood that our job is not to censor potentially tasteless or objectionable content nor dictate to publishers what type of content they may include in their games," the ESRB statement said. "ESRB's role is to objectively evaluate a game's content and assign age and content ratings that will be helpful in allowing consumers to make informed choices." Predictably, INA reaction to the game, the Achievement and the ESRB's apparent unwillingness to "do something" about it was expressed on the group's Facebook page largely with all-caps and heavy use of the exclamation point.